For June's competition, we were treated with a beautiful entry by Portugese animator Sergio Martins. On Anim School's blog, they interviewed him about his workflow and use of Malcolm. This allowed me to us to dig into other aspects of his work as both an animator and director. To begin, I must ask, can you do an impressions? It's funny you ask that, in my teens I used to do some impressions of teachers and people that I knew in person, it would get a good laugh from my friends at the time, but nowadays I can't do it no longer, I lost the ability I guess, ahah. Can you tell us a little about balancing your ambitions as both a director and animator? The initial motivation I had to became an animator was more about being able to tell stories I had in my mind, or share images/ideas I thought were interesting. When I started studying the work of animation masters though, I became in love with the art of character animation itself. As soon as I started working in animation, on the most part of the projects I've been, the thing that would define my position as a director or as an animator was the necessity that the specific project had at the time. For that reason, I have been obliged to share my time between both areas, if that wasn't the case, I'd probably be more advanced in one of the positions in terms of career. At the end of the day I think the most important thing is to be part of good projects, either by being part of a project where the Director has a great vision and I feel good about helping him bring his vision to life exclusively as an animator, or if I can manage to direct a project where I can trust the animation team. Both options will give me experience and will, hopefully, make me grow as an artist. For The Dream Walker, the project was several years in production. What was it like committing yourself to a project for this duration? It is a bit scary at first, It is like committing to run a marathon that goes for a couple of years, haha. The struggle is not so much about the initial sprint or energy you put into it as it is about perseverance and keeping track of your initial goal in spite of all the obstacles in the way, which are ALWAYS showing up. To dedicate 2 years to a 15 minute animation short keeps you constantly measuring the importance of each decision and can be extremely overwhelming sometimes, but once you get close to the final stage, it feels like you accomplished something meaningful, even if just for yourself. Was it the first time collaborating professionally with your brother? Fortunately, we have always worked on the exact same projects since we started. The first time we didn't work together was at the beginning of this year (2016), more than 10 years after working as a team, and, right now, we are working on the same project together again. I can't stress enough the importance of his contribution in my animations, he's input and extremely honest and direct feedback is definitely the main reason why my work gets to the level it gets, whatever that level might be. I feel that my animation reel, for example, is also in part his reel, he was the storyboard artist and layout artist for a big amount of the scenes I have there. On the short film, you worked alongside Tom Delonge (frontman of Blink182). Can you tell us a little bit about the Blink 182 animation on your account? At the time when I did that animation, the studio I was working at was in a tough moment and a lot of artist were being laid off. So, even though I had other job offers, I decided to use my free time to animate something that would direct me towards the type of project I would like to be working on. I'm a big fan of Tom Delonge's art, and since he is such a prolific artist in different mediums, I felt he could be interested in doing animation. So I started to look for something that could catch his attention, and ended up choosing Blink 182's mascot, mostly because it has such an “animatable” design to it. Luckily enough he was actually interested in bringing an animation project he had in mind to life. I can't thank him enough for the trust he put in me at the time. Being introduced to your reel, reminded me of Disney's Andrew Chesworth's. By this, I mean a beautiful emphasis on traditional animation AND a character poking something up their nose... please talk a little about your reel and the role this shot plays. 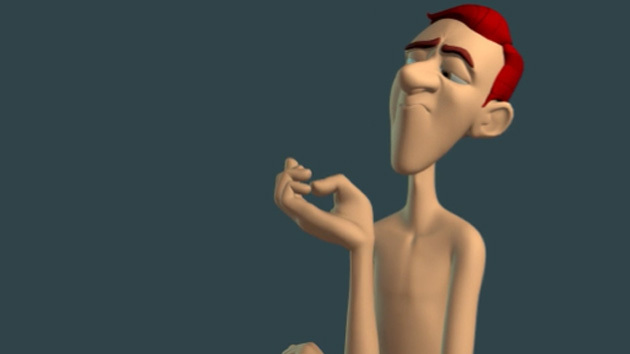 First off all thank you so much for even mentioning Andrew Chesworth when asking about my reel, he is an awesome animator that I can only aspire to be, and it is a pleasure to know my reel reminded you of his, even if it is for the ”character poking something up their nose” part, ahah. When I was putting my reel together I basically picked up some of the scenes I felt good about, from what I had animated in the last couple of years. That scene is from a short film I also co-directed that is coming out soon, but I can't really say too much about it yet. I did wondered a lot about putting that specific shot in my reel, since he is picking up his nose and swearing, and some people could not feel so comfortable with it. But I ended up choosing it because it gave a relaxed and a natural light-hearted feeling to it in contrast with the intense fighting scenes. Your show reel has some superb fight sequences (I have mentioned to your how much I loved the spinning of the umbrella). How did you approach some of the fight choreography? For the fight sequences of Poet Anderson I would discuss it with Edgar and we would choreograph the whole scenes in our heads and talk it out. After that he would do the storyboard, and once we were happy with it, I would do some very rough animation testing to see how the action worked from shot to shot. All of the fight scenes in the reel, except for the one you are mentioning, were done with no reference at all, but before I started doing the actual animation, a lot of problem solving and overall timing was already sorted out in a 2D rough previs pass where I could try out different things much easier. On the umbrella scene specifically, before I jumped into animation I searched a bit for fighting references, and I found a gif that I used as inspiration, what I remember I liked at the time was that the character was kind of still compared to his weapon that was moving around a lot. Also, his weapon was very blurry almost just suggesting the movement through the blur. Those two details were the starting point on how to approach that shot. And what about the vehicle shots? Were any particular films used as inspiration? 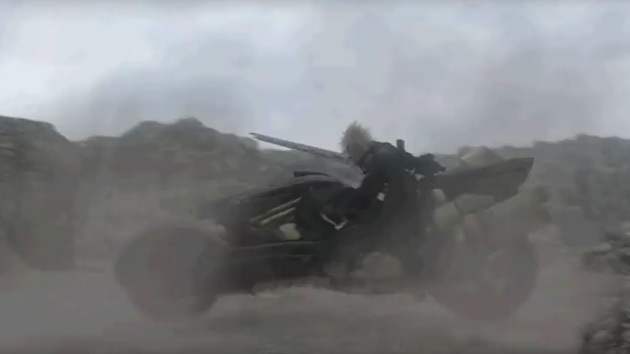 For the bike sequence we were very influenced by the Final Fantasy type of action. But tried to give a less crazy and more plausible feeling to it. Digging into your winning entry, for me, I see your characters as two male lovers. The transition complicates this choice in that they are contained within the same body. This is a little like Smeagol and Gollum, from Lord of the Rings. What is your interpretation of the two characters? They started by being a guy and a girl, but due to some trouble, I had to keep working with the same rig for the whole scene. I thought about having the character geometry changed, and even did some tests, where he looked like a girl (tiny nose and chin, bigger hair, etc) it worked pretty well, but, suddenly, the scene was feeling less interesting. I thought about it for a few days, and one day, by accident I stepped on a youtube video about multiple personality disorder and realized it would be way better to assume it is indeed the same person, to the extend of not even cutting from one shot to the other, and keep the character on screen the whole time. The challenge as an animator, was to make the same body have different personalities in a way the audience would accept it and, hopefully find it interesting. You spoke of the maya difficulties you had producing your entry. These steered you away from your original idea of a 'Life of Pi' audition. What were these challenges? The biggest problem I had was with the girl's arms, that kept twisting around all the time for no reason. It was an option in Maya 2016 that was not checked, but at the time I was not being able to solve it. The reason why that made me change the story is because I started animating the male's part and had very few days to do the whole animation for the girl's part. As soon as I spent a full day not being able to make her rig work I decided to not waste my time searching for another rig and simply start animating the girl with the male rig I had that was working fine. At first I simply made some geometry changes to the male character, to make it look like a girl, but as I explained, it was not very interesting, so I kept animating until I decided to have it being the same guy with some sort of different personalities. How do you feel your final entry compared to what you originally had in mind? I feel it came out more interesting and less cliche than what it would have been, unfortunately it is also a bit less funny. The idea I originally had in mind, had an extra wide shot at the end where we would see that the male character was actually standing on top of a mini boat on a really cheap set wearing only pants with all the lights pointed at him and holding a plush tiger. But I do think the way it turned out is a bit more original and fresh. In your ecritique, Keith Sintay was particularly impressed with the transformation from one character to the next, is achieved through the transition of a blink. I must ask the magician to reveal his trick. Can you tell us a little the execution of this idea and what inspired it? It's funny you mention the blink, I usually use blinks when I want the audience to know the character is changing it's thoughts, there are tiny nuances on the character's voice that imply the character is changing their feeling towards the situation even if a tiny bit and I usually put a blink on the thought transition. In this case I just exaggerated a lot more the blink on that part since he is not only changing his thoughts but he is actually changing his personality. The blink is definitely important, but I think the eye expression changing right after the blink is what brings the necessary contrast to help sell the different personalities. Before the transition, the character is kind of looking up and right, and is always looking at the other character a bit through the corner of his eyes, kind of in a arrogant/suspicious way, which changes dramatically after the transition. Right after the blink he has a much more clear and open/honest eye direction, which I hope helps sell the idea that it is indeed a very different personality with different thoughts going inside his head. At the end of your interview with Anim School, you share a link to your Pininterest account, showcasing animation pencil tests. Do you have any particular favourites? I love, above all, the acting, the drawing and the timing on Sergio's animations, it keeps demanding your attention as you watch it. His characters have such a specific personality and maneirisms that they become unique. I always have fun watching Nik Ranieri pencil tests. Even though I wanted to be an animator before, Hades was one of the first characters that made me start thinking seriously about acting in animation. It's impressive how clear and well presented his animation is, it makes it look so effortless it can trick you into thinking it is easy to do ahah. Even though he is a terrific technical animator, what I love the most about his work is how much heart he brings to his drawings, his characters feel like they have such a depth, something hard to find on any other animator. I just like Marc Davis simplicity and beautiful drawings. There are so many awesome animators I'm leaving out, but the list can't go on forever ahah.